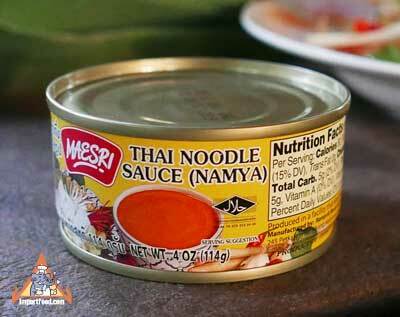 This is a very easy way to add Thai spice to any quick noodle dish. Boil 1 can with 1.5 cans water, serve with chantaboon rice noodle or jasmine rice. Some people especially love this dish if it's seasoned with fish powder with chile. Ingredients: cobia fish, coconut milk, wild ginger, sugar, dried red chiles, garlic, salt, shallot, msg, lemongrass, galangal, kaffir lime, spices (corriander seeds, cumin, cardamom). Product of Thailand. Maesri Brand is recognized in Thailand as a high quality export product with rich taste and authentic flavor. The convenient and inexpensive 4 oz can is enough for 6 large servings, and we ship this in case quantity to many restaurants who depend on Maesri to make their restaurant Thai meals. Chances are good that your local Thai restaurant uses Maesri as the base for their namya noodle dish.